Reinventing alfalfa that gives farmers options, not limits. Alfalfa growers are used to choosing either yield or quality. With HarvXtra™ Alfalfa with Roundup Ready® Technology, they can have both. 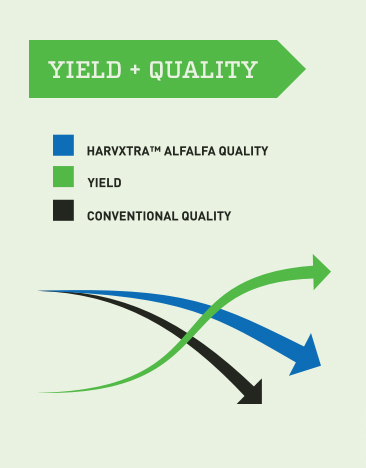 HarvXtra™ Alfalfa trait technology gives farmers unprecedented control over the yield-versus-quality tradeoff with a more flexible cutting schedule. Wider cutting windows mean improved quality or greater yield potential, compared to conventional alfalfa at the same stage of maturity. And HarvXtra™ Alfalfa is stacked with Roundup Ready® technology, delivering increased yield potential with faster stand establishment and less competition from weeds or traditional cover crops. It isn’t just the most advanced alfalfa in the industry — it’s the biggest advancement in the field. 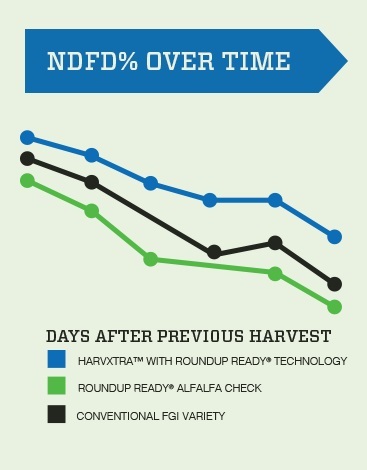 By reducing the amount of lignin in the plant, HarvXtra™ Alfalfa with Roundup Ready® Technology fundamentally changes the relationship between forage quality and stage of maturity. Less acid detergent lignin (ADL) and higher neutral detergent fiber digestibility (NDFD) can command a higher price per ton come harvest. 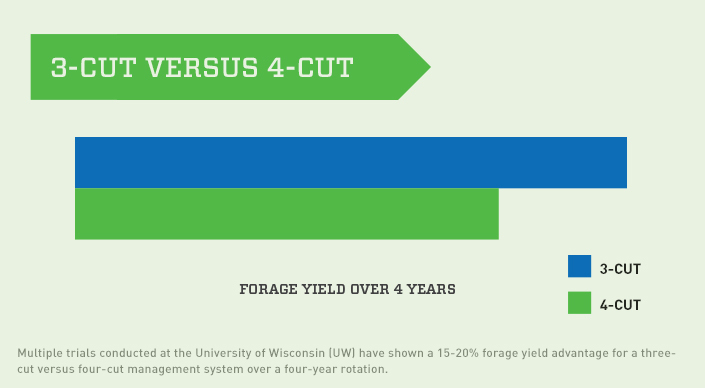 Multi year University of Wisconsin trials of conventional alfalfa have demonstrated a 15-20 percent forage yield advantage for three-cut versus four-cut management systems, at the expense of lower quality. 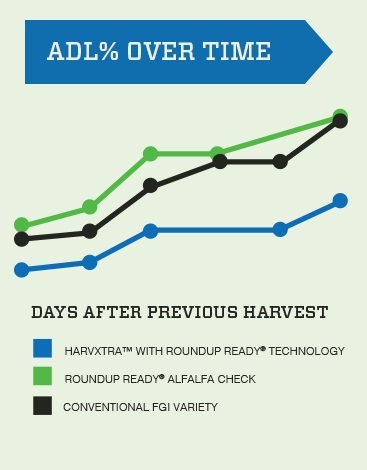 HarvXtra™ Alfalfa with Roundup Ready® Technology lets growers delay harvest for 7-10 days to increase tonnage without making that forage quality sacrifice. Fewer cuttings also have the added benefits of less stress on alfalfa stands and reduced harvest costs. Genetically-enhanced HarvXtra™ technology improves alfalfa beyond what is possible through conventional breeding techniques. Gene suppression rewires the way alfalfa plants make lignin. This changes both the lignin content and its composition, while maintaining the high-quality characteristics that matter most. Use Limitations for HarvXtra™ Alfalfa with Roundup Ready® Technology. HarvXtra™ Alfalfa with Roundup Ready® Technology hay or hay products must be directed only to Canadian or U.S. domestic uses. It is a violation of national and international law to move material containing biotech traits across boundaries into nations where import is not permitted. Growers should talk to their product purchaser to confirm their buying position for this product. This technology may be sold and plated only in the provinces of Ontario, Quebec, New Brunswick, Nova Scotia, Prince Edward Island and Newfoundland. Please contact Forage Genetics International at 855-237-9897 or refer to the Technology Use Guide for additional information. ALWAYS READ AND FOLLOW PESTICIDE LABEL DIRECTIONS. Roundup Ready® technology contains genes that confer tolerance to glyphosate, an active ingredient in Roundup ® brand agricultural herbicides. Agricultural herbicides containing glyphosate will kill crops that are not tolerant to glyphosate. Roundup Ready® and Roundup® are registered trademarks of Monsanto Technology LLC, Monsanto Canada, Inc. licensee. HarvXtra™ is a trademark of Forage Genetics Internal, LLC. HarvXtra™ Alfalfa with Roundup Ready® Technology is enabled with Technology from The Samuel Roberts Noble Foundation, Inc. Restrictions applicables à l'utilisation de la luzerne HarvXtraMC avec la technologie Roundup ReadyMD. Pour la saison de croissance 2017, les producteurs de luzerne sont tenus de limiter la circulation de tout produit obtenu à partir de la semence ou de la culture de luzerne HarvXtraMD avec la technologie Roundup ReadyMD, incluant le foin et les produits de foin, aux marchés intérieurs canadien et américain seulement. Il est illégal, en vertu des lois nationales et internationales, d’exporter des produits contenant des caractères issus de la biotechnologie dans un pays où l’importation de telles marchandises n’est pas permise. Les producteurs devraient communiquer avec leur négociant en grains ou acheteur de produit pour confirmer la politique de ces derniers relativement à l’achat de ce produit. Cette technologie ne peut être vendue et semée que dans les provinces de l'Ontario, du Québec, du Nouveau-Brunswick, de la Nouvelle-Écosse, de l'Île-du-Prince-Édouard and de Terre-Neuve-et-Labrador. Veuillez communiquer avec Forage Genetics International au 855-237-9897 pour de plus amples renseignements. VEUILLEZ TOUJOURS LIRE ET SUIVRE LES DIRECTIVES DES ÉTIQUETTES DES PESTICIDES. La technologie Roundup ReadyMD contient des gènes qui procurent une tolérance au glyphosate, un ingrédient actif des herbicides pour usage agricole de marque RoundupMD. Les herbicides pour usage agricole qui contiennent du glyphosate détruiront les cultures qui ne tolèrent pas le glyphosate. Roundup ReadyMD et RoundupMD sont des marques déposées de Monsanto Technology LLC. Titulaire de licence : Monsanto Canada, Inc. HarvXtraMD est une marque déposée de Forage Genetics International, LLC. La luzerne HarvXtraMD avec la technologie Roundup ReadyMD profite de la technologie de la Samuel Roberts Noble Foundation, Inc.